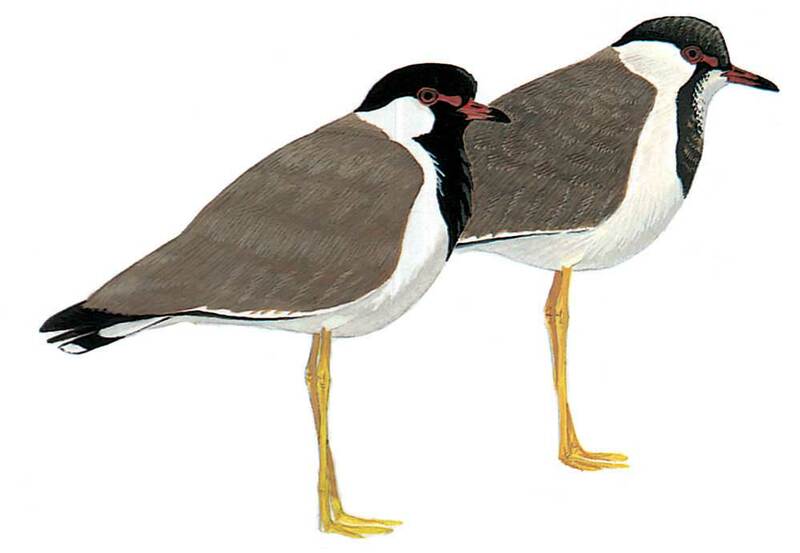 Rather large, colourful plover; easily identified by long bright yellow legs, black head and centre of breast, white ear-coverts, side of neck and breast-side; eye-ring and wattle in front of eye is red. Flight is light with slow wing-beats and shows similar wing pattern to Spur-winged and White-tailed, but tail has black subterminal band with broad white terminal band; yellow feet project distinctly beyond tail. Juvenile much duller with chin and throat almost white, black areas grey-brown, and wattle is tiny or lacking. Fairly tame.